In a small saucepan, bring water to a boil. Then, add purely elizabeth ancient grains and turn heat down to a low boil. Cover and cook for 15-20 minutes. Coat the bottom of a separate frying pan with coconut oil. Heat the pan on medium high heat. Add in the onions and cook for 5-7 minutes or until tender. Remove the onions—set aside—and add kale to the already heated pan. Sauté the kale until wilted (1-3 minutes). Quickly remove kale from heat. 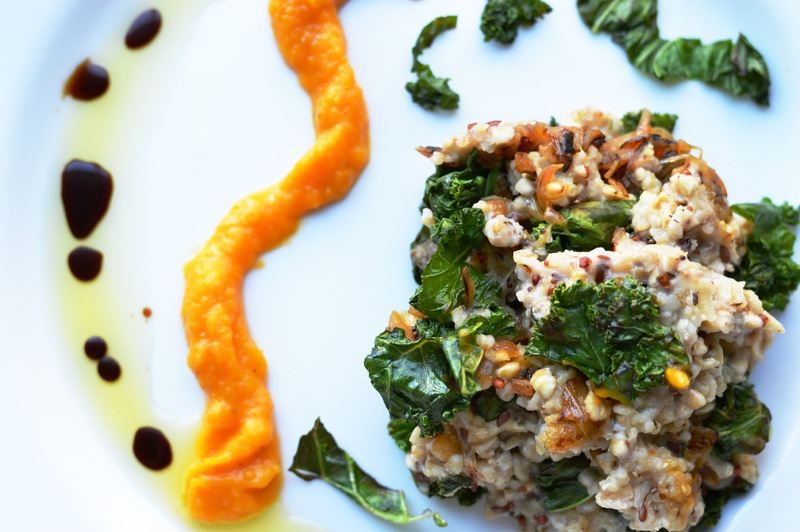 Combine onions, kale, olive oil, and balsamic with ancient grains. Serve with a side of “Butternut Squash Purée”; OR, mix “Butternut Squash Purée” into the ancient grains for a more intense flavor (recipe follows). Preheat oven to 400. Place vegetables in a bowl and massage with oil of choice. Line a baking tray with tin foil. Spread vegetables out on the prepared tray and season with salt and pepper. Place vegetables in the oven and roast for 40 minutes. Then, spoon 1/2 of the roasted veggies into a food processor and blend until smooth. Repeat step until all of the remaining vegetables are puréed.